Need a form related to cars and automotives? Click a category below to save time and spur ideas. Form Description: Do you have a bunch of equipment that get's shared around your company? Maybe you have a fleet of vehicles with no specific assigned drivers? Well, if that is the case then this form can be an invaluable help to you and your company. Easily keep track of the equipment, purpose, operator, and other vital operational information with this easy to fill out form. When you are completed, simply print it out, and have the dispatcher print and sign their name. This particular version of the form has extra wide rows for an easier ability to hand write the information. You can download a PDF version of the "Personalized Equipment Sign Out Sheet (Wide Row Numbered)" form absolutely free. You can also, for a small payment, download a fully editable version of the form that you can customize as you desire. (Don't know which format to choose? Here's how to make your choice.) What would you like to do? 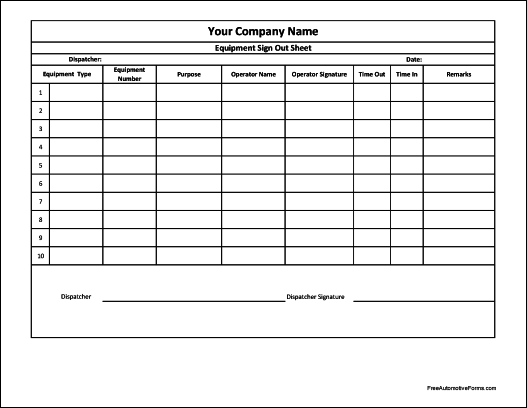 FreeAutomotiveForms' free "Personalized Equipment Sign Out Sheet (Wide Row Numbered)" form is associated with the following keywords: automotive, equipment check out, equipment sign out, fleet sign out, wide rows, numbered. If you choose to download the Excel version of the form, you may want to learn more about how to use Excel. You can find lots of great information about how to use Excel at the ExcelTips website. FreeAutomotiveForms.com is a service of Sharon Parq Associates, Inc. Copyright © 2019 by Sharon Parq Associates, Inc.